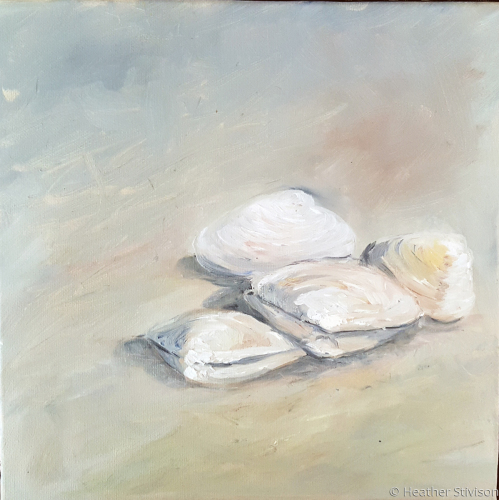 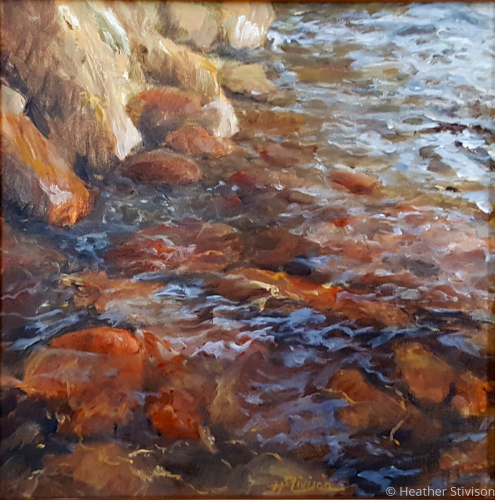 This artwork is on view at Norton Gallery, 330 Elm Street in Padanaram Village, South Dartmouth, Massachusetts. 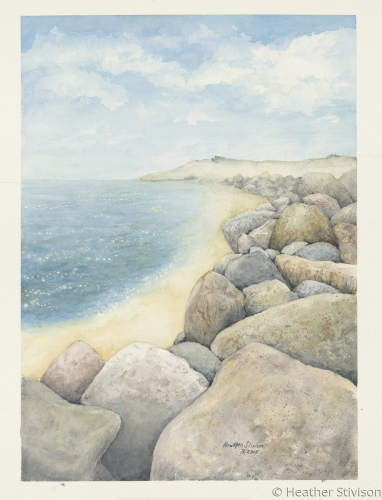 Please contact them at 508-997-9674 to purchase. 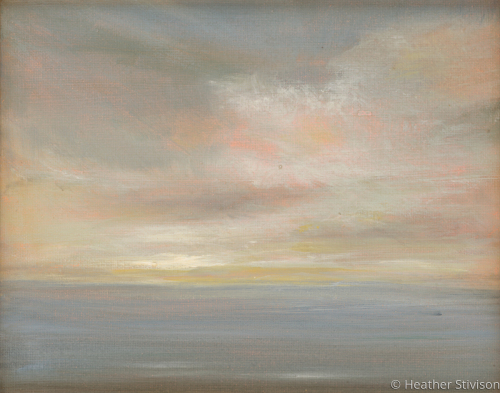 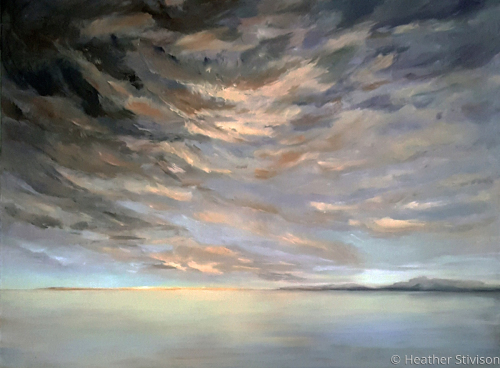 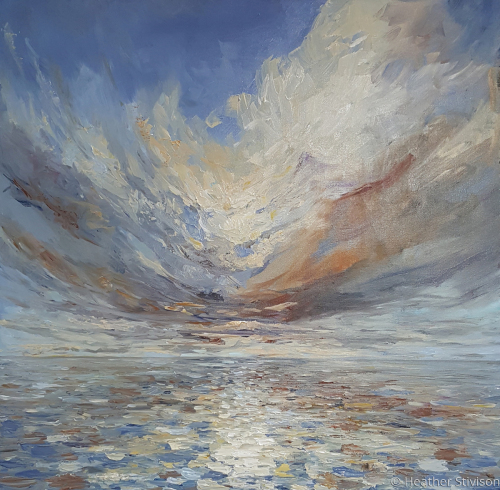 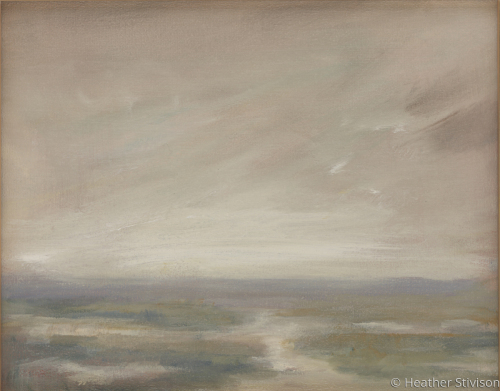 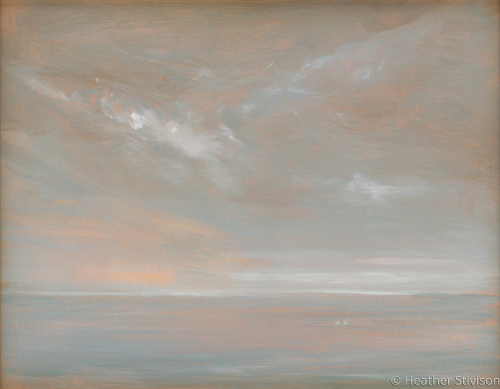 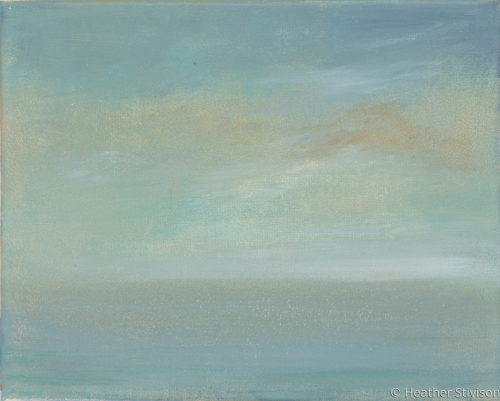 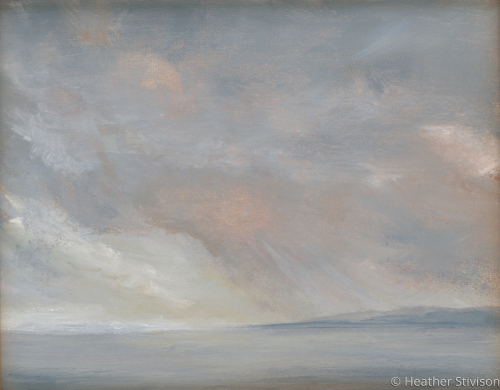 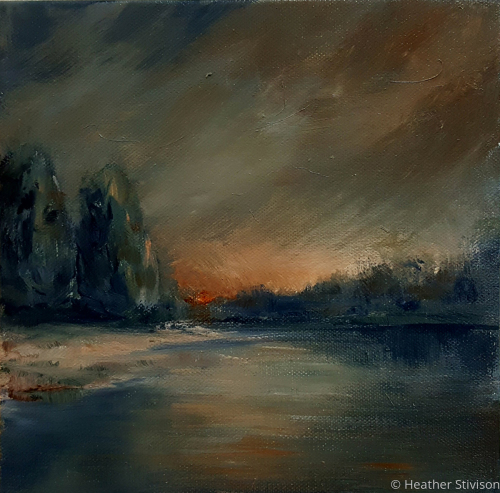 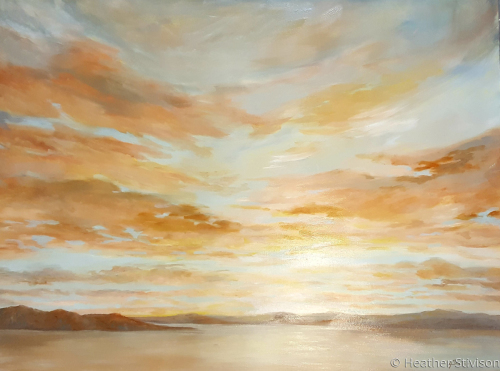 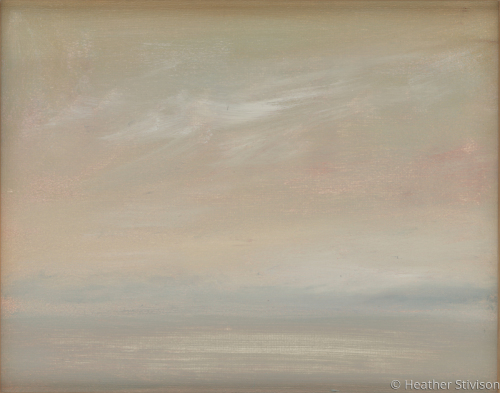 One of a series of paintings considering the fleeting patterns of water and sky. 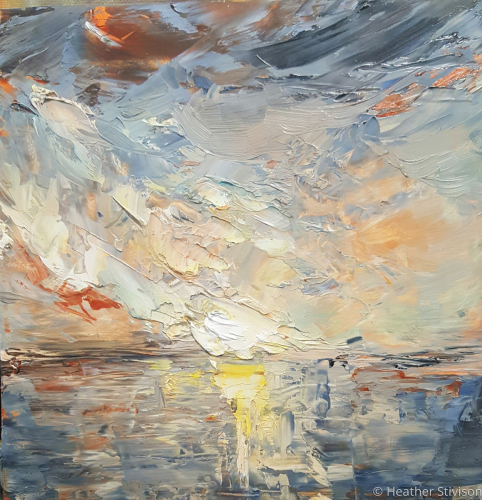 This abstracted, palette knife painting explores the relationship between warm and cool colors of Buzzards Bay, Massachusetts. 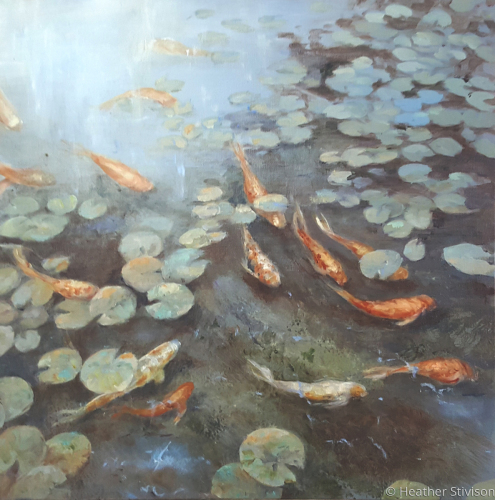 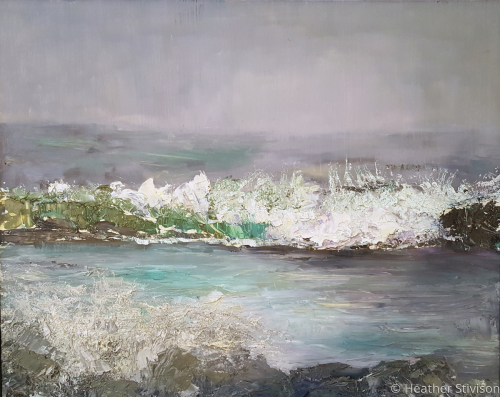 The painting received favorable mention by art critic Don Wilkinson, in a review of the South Coast Artists' Invitational exhibition at Gallery X. 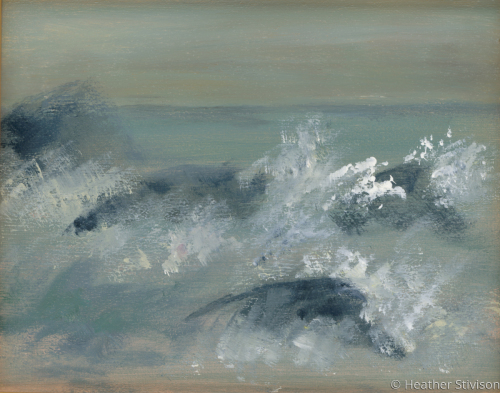 One of a series of paintings considering the fleeting patterns of water. 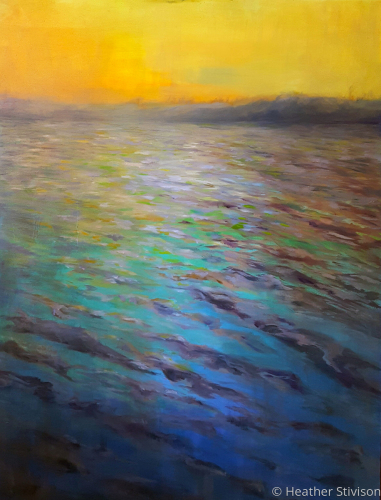 This one explores the warmth and vibrant colors of sunset in the tropics. 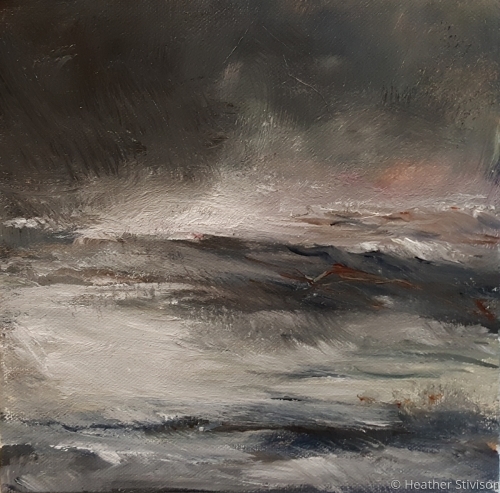 Contrasting the activity of the rough surf with moody stillness of the atmosphere and low lying clouds in the distance at the end of a summer squall. 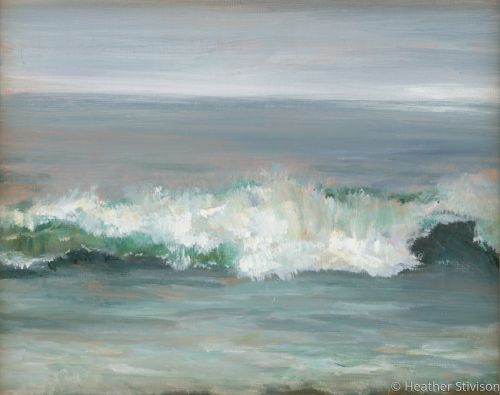 Musing on how much sea resembles sky, and how the foam of waves crashing on rocks resembles clouds. 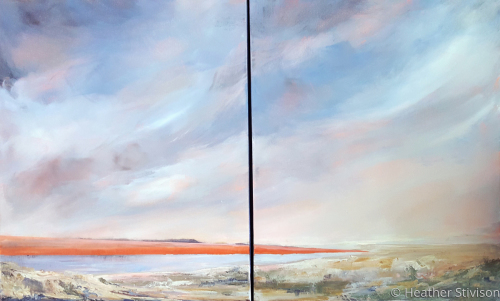 Oil and acrylic diptych composed of two 16" x 20" stretched canvases. 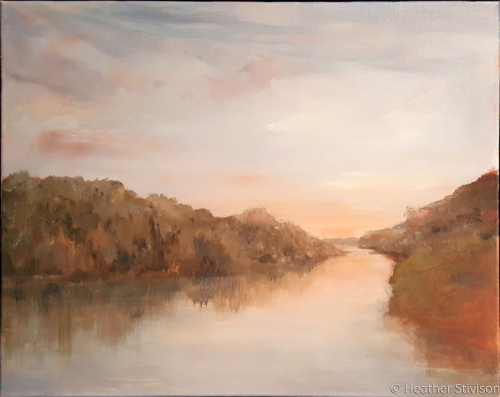 Walking the marked nature trail around Lake Shaftsbury, Vermont, I came upon this quiet scene. 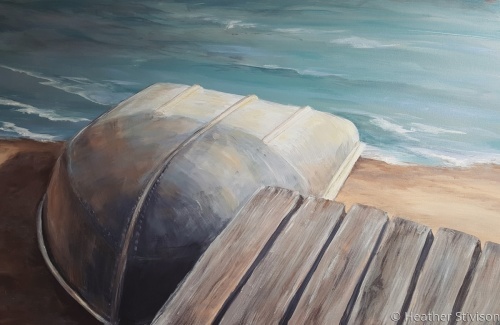 I saw a special kind of beauty in the way this beaten up dingy showed its age and character. 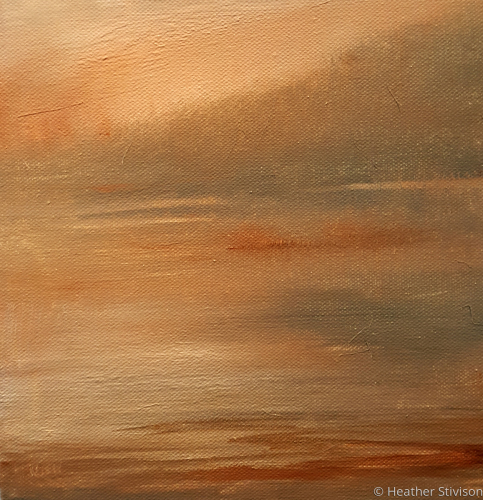 This combined with play of light and the warm and cool colorations of the afternoon sun on its metal enticed me to paint it. 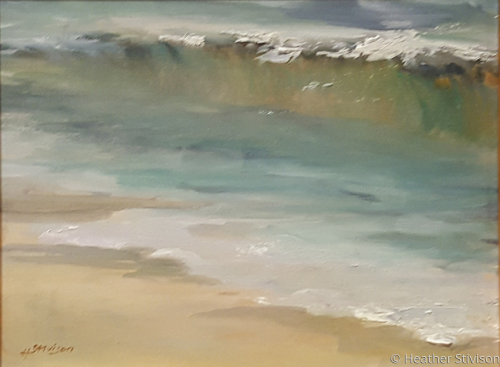 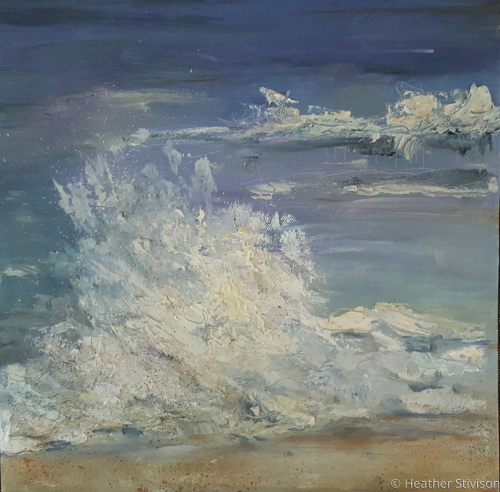 Acrylic and oil painting on canvas, created from a memory of the moody atmosphere of a Nantucket beach just after a storm passed out to sea. 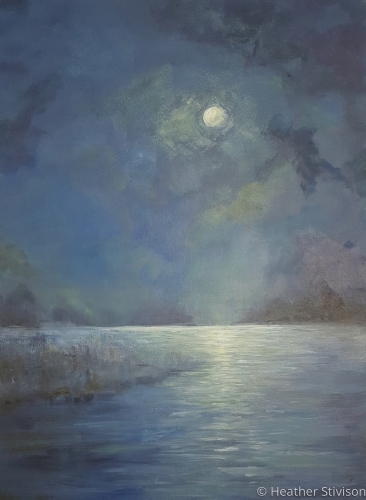 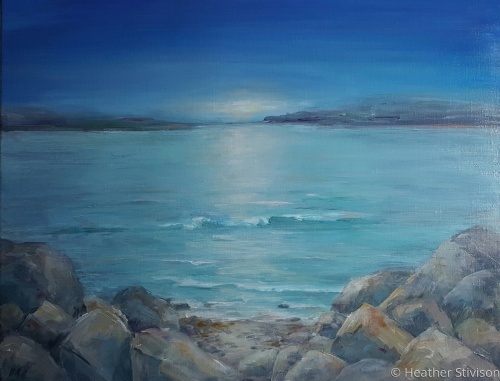 The horizontal composition was chosen to underscore the peaceful nature of the quiet, nocturnal scene of moonlight over softly lapping waves. 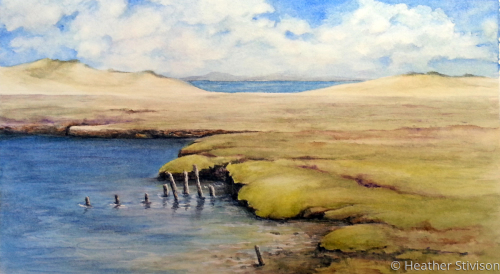 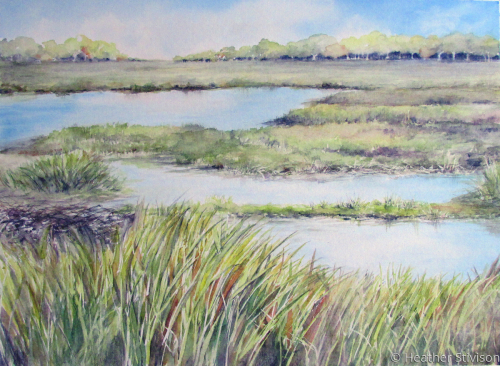 A watercolor of the changing, late-summer view of the saltmarsh off Smith Neck Road, South Dartmouth, Massachusetts.